Among the many compelling reasons to try to keep Diafra Sakho at West Ham is his propensity to pop up with sensational hair styles. As any proper expert on modern footie will readily confirm, a healthy representation of colourful barnets is a must have for any wannabe top club. 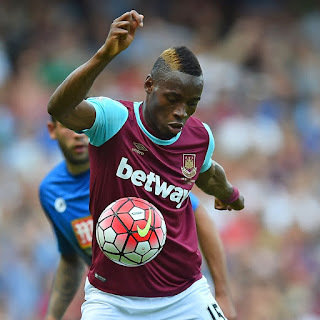 To that end Sakho has delivered in bucket loads with his variety of shaven designs and punky mohawkery. But happily, Sakho can now be let depart with the news that the Hammers have identified a suitable replacement in French left back Arthur Masuaku. 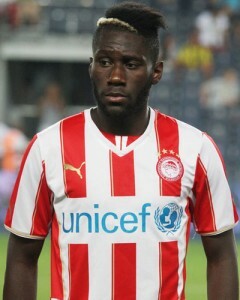 The 22 year old is currently on the books at Olympiacos having graduated from the Valenciennes academy in France. As the picture demonstrates, Arthur is more than capable of delivering the kind of deliciously foolish hair arrangement that Hammers fans crave. Masuaku is pacey and particularly strong going forward. He has represented Les Bleus at U18 and U19 level and is tipped to replace Patrice Evra who will be 47 years old on his next birthday, probably. Masuaku's talents have not gone unnoticed with Roma and Inter both said to be interested. Word is that the Hammers have tabled a £6m bid and that Masuaku is on his way for a medical.